When most people think of powering their homes with solar energy, they imagine a fleet of unsightly panels covering their roofs and yards. But that’s changing fast. 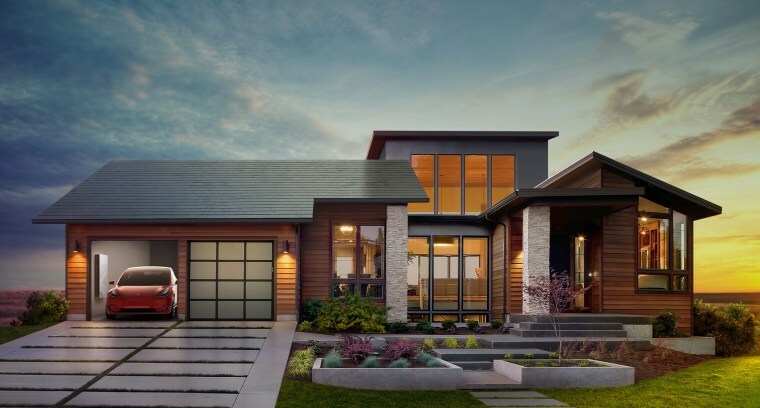 This month, Tesla will begin taking orders for solar shingles that can generate power for the home and still look like everyday roofing tiles. But roofs aren’t the only surfaces that can hide solar cells. There’s a revolution underway to transform windows, skylights, and roads to generate electricity. The future of solar power will be built into every part of our daily lives. Traditional solar panel arrays take up a lot of room and monopolize whatever space they’re mounted on. But with these new solar technologies, called building-integrated photovoltaics, solar cells can serve double duty as construction materials and power producers. This technology won’t replace rooftop panels and solar farms. But it can use the abundant surface area on homes and commercial buildings to feed our power needs. “People are getting pretty creative with what you can do with a solar panel these days,” says Robert Tenent, a scientist at the National Renewable Energy Laboratory. Solar shingles, including those designed by Tesla, are one solution of which homeowners can take advantage. Their model will come in four styles, including smooth glass, French slate, and Tuscan tiles. The solar cells, planted under tempered glass, are only visible from certain angles, so a passerby on the street won’t detect them. The shingles will generate power that can be used on the spot, or stored for the home in Tesla’s Powerwall battery. Tesla CEO Elon Musk claims the company’s solar shingles will be more durable, more affordable, and provide better insulation than today's roofing materials. Other brands, such as Lumos Solar in Boulder, Colorado, have designed technologies that can be installed in patio covers, carports, skylights, or balcony railings that receive plenty of light. Even tables and chairs can be put to work. Spain-based designer Onyx Solar has created photovoltaic glass that can be fitted onto outdoor furniture, allowing it to generate enough power to charge electronics. It may be some time before energy-producing building materials make sense for widespread use in homes, but it’s likely to become more practical as prices drop. In the meantime, the solar-embedded surfaces popping up on commercial buildings can offer homeowners a peek at what’s brewing. Windows might seem like an odd place to embed solar cells — after all, they’re designed to let sunlight shine through, not capture it, and receive less direct sunlight than rooftops. But because windows take up so much space on buildings, especially in cities, they’re prime real estate for solar technologies. Windows that can generate solar energy will initially show up in commercial construction, Tenent says, and then spread to homes. But first, designers will have to figure out how these cells can produce energy while being clear enough to see through — no one wants solar energy if they’re sacrificing the view. One approach: capture only the parts of sunlight we cannot see. Ubiquitous Energy, a California-based MIT spinout, has designed solar cells that appear transparent because they only absorb ultraviolet and infrared light. Ubiquitous Energy wants to apply their thin, photovoltaic film to every surface, from home windows to handheld gadgets, covering screens on phones and laptops so they can become solar-powered. The brand plans to test this technology within two or three years, Barr says. Meanwhile, Onyx Solar has created a canopy dotted with color-changing skylights for Miami's AmericanAirlines Arena, as well as photovoltaic shade canopies for the Union City train station in California’s Bay Area. They are also developing floors fitted with photovoltaic glass tiles, first seen at George Washington University's Science and Technology campus in Virginia. For some installations, Onyx embeds square solar cells between panes of glass, spaced out such that light can shine through the areas between them. In other instances, they coat glass with solar cells and then use a laser to remove thin lines, allowing the glass to appear more transparent. These cells, made of amorphous silicon glass, capture indirect light, which helps them start generating energy earlier in the day and keeps them working in cloudy conditions, says Diego Cuevas, the company’s vice president of business development for North America. Several intrepid companies are even testing how streets can generate solar energy. In October, Solar Roadways laid a patch of tiles on top of asphalt in Sandpoint, Idaho. The eventual goal is that these solar cells — sturdy enough for a Mack truck to drive over — will one day charge electric cars in nearby parking lots. The Netherlands is already testing its solar roadway along a bike path in Krommenie, while France’s Wattway project is investigating how its surface performs in different environments around the world. It’s possible that homeowners could soon purchase panels to install on their driveways, a Wattway spokesperson told NBC MACH in an email. Adding solar cells to the environment comes with challenges. They may end up shaded by surrounding buildings or mounted at an angle that allows less sunlight to reach them. And if the cells will be walked or driven on, they must be extremely sturdy. Still, supporters of this new, creative form of solar power are confident it can be used on a wide scale. “When we look at the benefits of building-integrated [photovoltaics]…they just kind of go on and on and on,” says Brendan Owens, chief of engineering for the U.S. Green Building Council. In many cases, solar cells can be retrofitted onto existing structures. Having a building generate its own energy helps shrink its carbon footprint, and is more efficient than drawing power from the grid. “You lose a tremendous amount of energy simply in transfer from power plants into the point of use,” Tenent says. In 2015, residential and commercial buildings accounted for 40 percent of the energy consumed in the United States. But solar-generating surfaces, together with traditional solar arrays and other tricks to boost energy efficiency, are helping capture enough energy to offset our power needs. Eventually, the cells embedded in windows and shingles could produce as much energy as homeowners gobble up. “We still need a power grid to serve as backup and redundancy and resilience,” Owens says. But future buildings will rely on it less and less, and be able to give more power back to the grid. Using the surfaces within buildings to generate solar energy may even become so widespread that architects take it for granted.